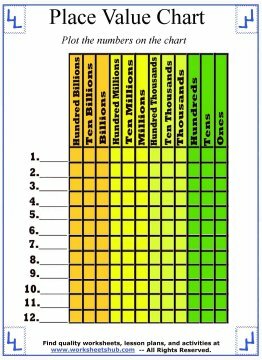 I've already discussed how to read and use a Place Value Chart in a previous lesson. If you haven't covered it yet, you may want to review the information with your child (link at bottom). 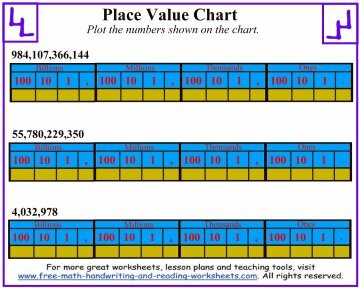 On this page, you will find chart worksheets that focus on place value. Whereas the previous lesson dealt with showing you how to use the chart, this lesson will have students filling out the chart by plotting numbers on it or having them write out the numbers in their entirety by using the chart. 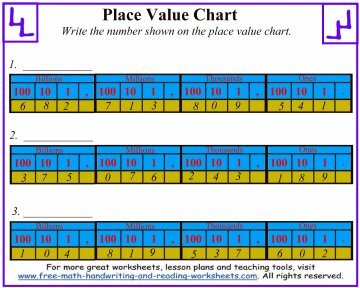 If you are a teacher or homeschooling parent looking to create your own place value worksheets for personal use, you can download a chart template below. The first couple of sheets deal with smaller numbers--only up to the ten thousands place. In the first paper you'll see three different charts. Above each chart is a number. Have your students write the number in the box, being sure to place each number in it's proper place value. The second chart is similar except students will be working in reverse. Each chart already has the numbers plotted out on it. Have your child write the correct number above the box using the place value to determine the number. The next couple of worksheets follow the same rule, but they use larger numbers. The chart may look a bit confusing because it condenses the chart used in the first two sheets (which only goes up to the 'Ten Thousands' place) into one smaller section of the chart. 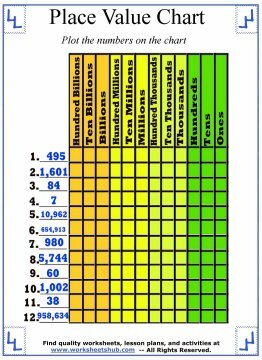 These charts also show how each place, billions, millions, thousands, and ones, can be divided into three smaller sections. For example, you can have 100 'ones', 10 'ones', or 0-9 'ones'. The same goes for the other positions on the chart. You can have 100 'thousands', 10 'thousands', or 0-9 'thousands'. These larger charts easily show how each place can be divided. The final paper is a simple writing out of various numbers. There are twelve different numbers total. Students need to plot the numbers out on the chart. This chart looks a bit different, but uses the same principles as the others. 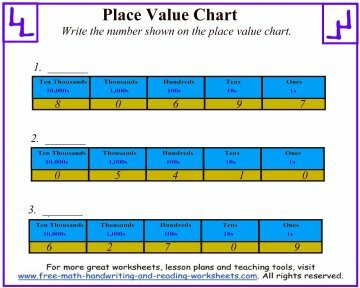 Remember that you can print out your own templates to create your own problems when you visit the 'Place Value Charts' lesson below. 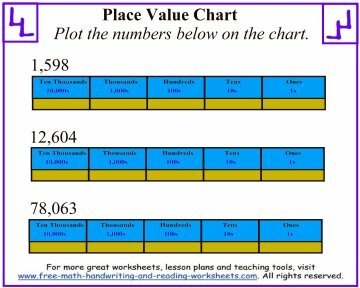 I've created more lessons and worksheets covering place value. You can also download blank templates of the worksheets above to create your own activities for you students or child. See the pages below to learn more.